There’s a great discussion going on over at TPMCafe on the new book, Charm Offensive: How China’s Soft Power Is Transforming the World . Andrew Cleary summarizes the discussion for those who haven’t been following it. I don’t see China as the second (third? fourth?) wave of the Red Scare, but I do think that it’s very much worth paying attention to. In my view, it embodies capitalism (as practised) at its most brutal, and that those of us who think capitalism provides a good path forward need to consider many of the tough issues raised in doing business with China. If IP standards are important enough to be internationally observed, why not labor standards? Why is China making so much progress in Africa? Did China’s bid to control the Panama Canal threaten the US? Check out the book and jump in, if you like. 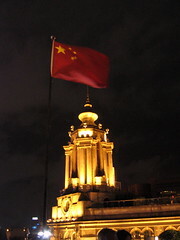 Picture taken from the Bund, on my 2004 trip to Shanghai. More photos from that trip here. If they can’t refine petroleum . . .